Never before during our travels had we encountered a situation such as the one we faced when arriving in Johannesburg, South Africa. Tour books and fellow travellers both warned us that Jo'burg was a dangerous place: if a tourist ventured out without the proper guidance, it was not a matter of if, but when he/she was robbed. Now, we like to think of ourselves as adventurous travellers, but we had to weigh the pros (personal safety) with the cons (giving in to what could just be paranoia). We came to the decision to skip Jo'burg and head straight to Pretoria. 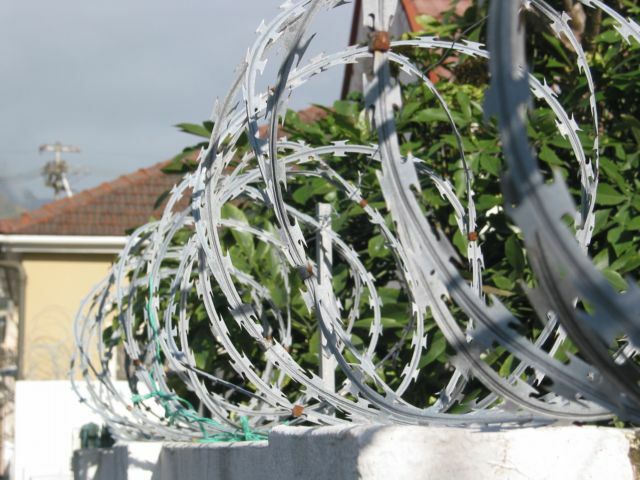 Still, the presence there of "Armed Response" placards and barbed-wire topped fences surrounding every (white family's) home hardly made us feel like exploring on our own. It may have been an overreaction, but the present climate in South Africa with regard to racism, poverty, and crime (even ten years after the end of Apartheid) is a very complex one ... one we needed more time to work out. It may seem strange, then, that we next decided to rent a car and head directly for a place so dangerous you can't get out of your car during the day. 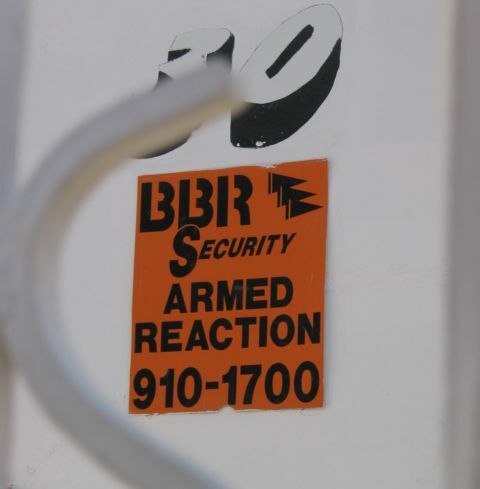 A place so dangerous you sleep in a gated, locked campground at night. 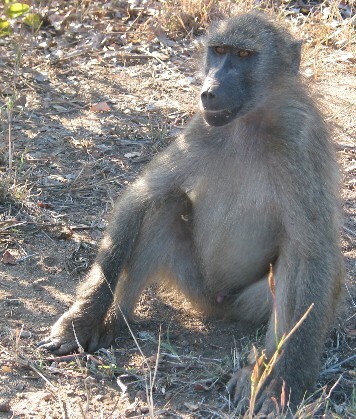 But that's the deal if you want to see the wild animals of South Africa's Kruger National Park. The park is enormous: the size of Massachusetts. Game viewing is done, for the most part, in your own vehicle. We would be on the park roads as soon as the gates opened (at 5:30am) because that, along with late afternoon, was the best time to spot the animals. 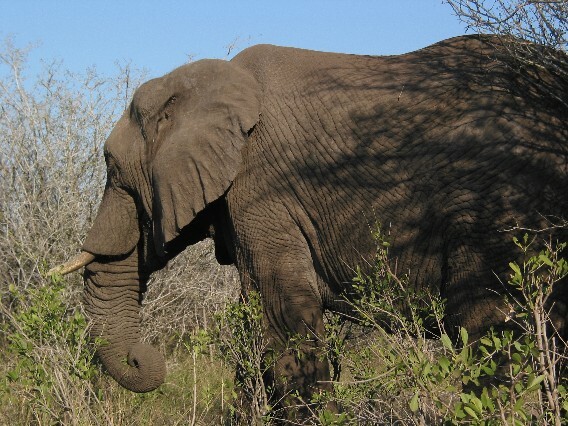 The list of animals we saw is too long for this space (our knowledge of African antelope species verges on the staggering) but we can tell you about the lions, rhino, elephant, and buffalo. Those 4, along with the leopard, make up the "Big 5", so-named by hunters because they are the most dangerous animals to hunt. We spent three whole days driving slowly around the park, constantly scanning the "bush", and were thrilled with each new discovery. South Africans we met are (rightly so) very proud of Kruger. 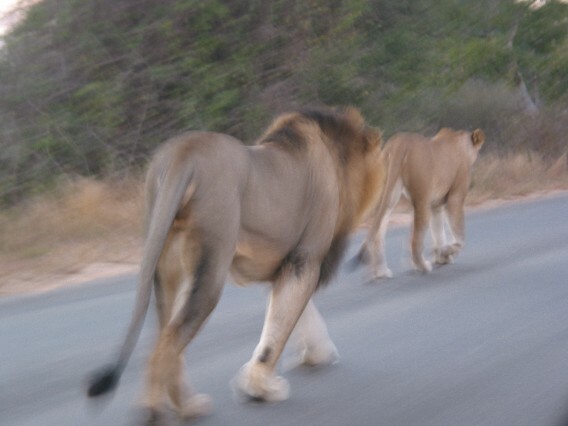 More than once during our travels fellow campers would pull out their Kruger videos they just happened to be carrying with them and show us their proudest sightings (ask us one day about the lion video worthy of the Discovery Channel). 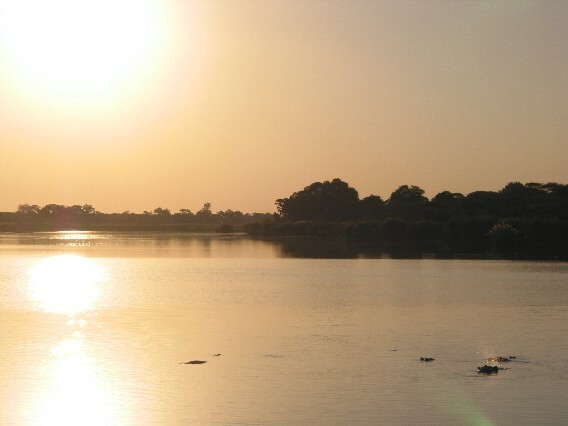 Botswana is not a country we had originally planned on visiting, but as it lay between Kruger Park and Namibia (our intended destination) we thought we would check it out. 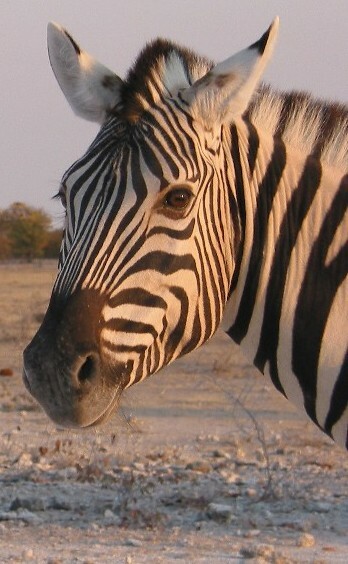 Botswana's game parks are considered among the best, most "wild" on the continent. Unfortunately for us, they are also the most expensive. The government's policy is geared to encourage "high end" tourism. The idea is to reduce the environmental damage by reducing the number of travellers. Good idea, although we are anything but "high end" so Botswana became little more than a transit country for us. We did, however, take advantage of having a car to give rides to locals. It was a great way meet people from Botswana (and Zimbabwe it turned out) and return the favor to all those who have picked us up while hitch-hiking on The Enchilada. We found that even with picking up riders, our car was making it difficult to meet locals. 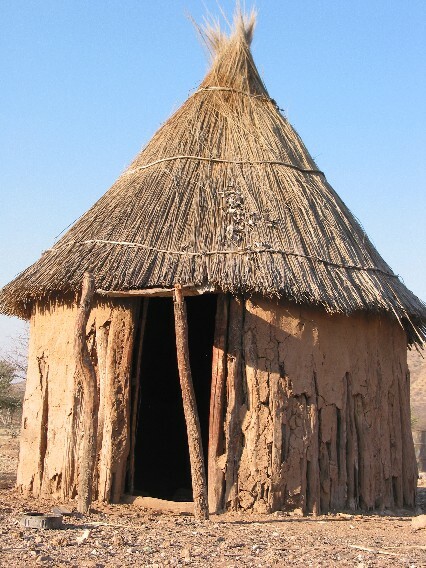 Whether flying by huts at 70 mph or pulling up in a shiny new car to villages where no one could afford a used one, did not lead to what we would consider "genuine" encounters. So once in Namibia we tried a new tactic. We parked the rental car for a few days at an old Finnish mission (now a museum) and walked around the nearby villages. We still didn't meet too many adults, but the afternoons spent playing and singing with the children were wonderful and memorable. 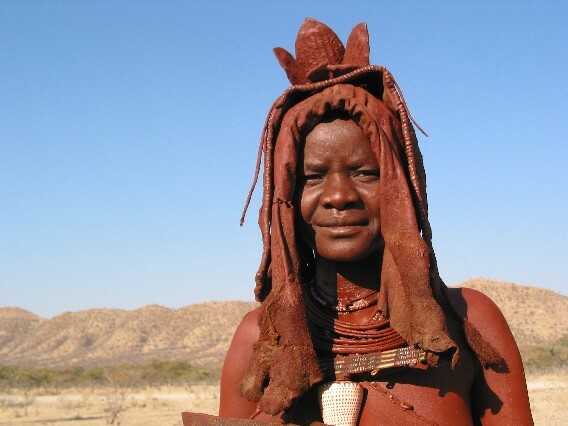 A few days later we hired a guide in the Namibian town of Opuwo to take us to a Himba village. 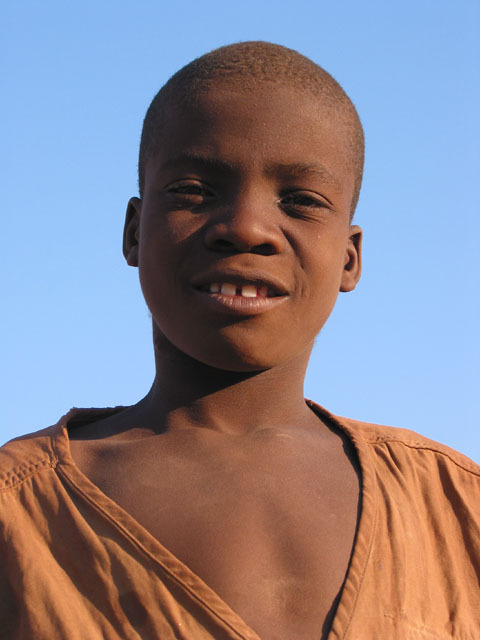 The Himba, like some other native African tribes, still hold on to a traditional lifestyle of farming and herding. But, honestly, what sets them apart is their appearance - particularly the women. Not only is their traditional dress very revealing (by western standards) the females coat their entire bodies in a red dirt/animal fat (or vaseline) mixture giving them a distinct, other-worldly appearance. Did You Know Black Rhinos and White Rhinos are the Same Color? 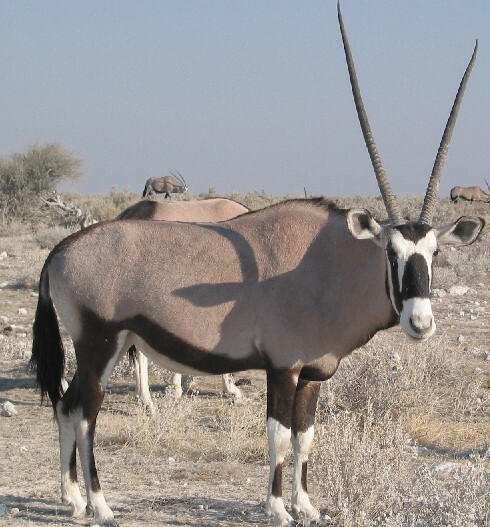 Namibia was where we planned our second wildlife park visit. 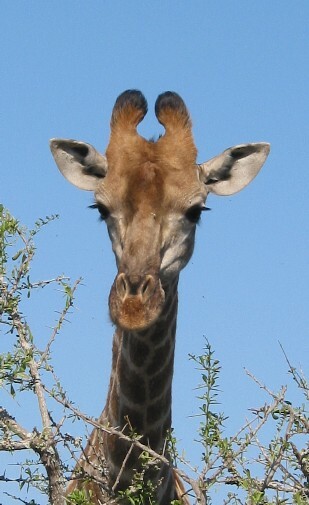 In Etosha National Park we saw many of the same animals as in Kruger but in a much different setting and much larger numbers. The desert-like environment of Etosha means that when you stake out a water hole, you are likely to see hundreds of zebra, scores of elephants, and dozens of other species ... all perhaps at the same time. It gave us that National Geographic moment we had been waiting for. 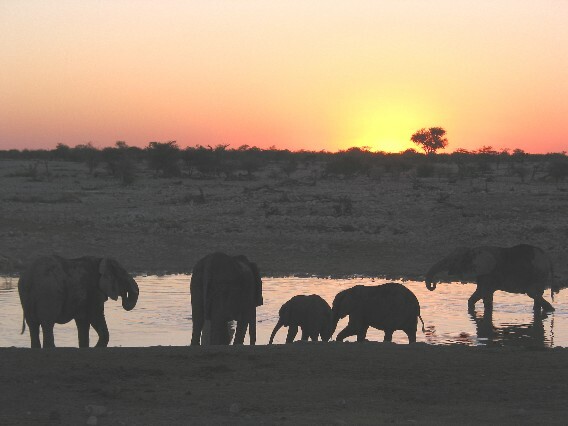 The campgrounds, or rest camps, in Etosha all sit beside waterholes which are illuminated at night and provide fascinating viewing. It's something like watching a theater performance. Out of the darkness different animals emerge, play their role, interact with each other, then exit the stage. On two nights we were treated to visits from the rare and endangered black rhino. Not all animal visits at Ethosha were welcome, though. Late one night an uninvited guest (a black-backed jackal, we presume) snuck into our campsite and ate through one of our tent straps. Good thing Garvin is becomming handy with a needle and thread. Unfortunately, in a region where many (and in Nambia, most) roads are gravel, dirt, or sand and where most people drive 4 wheel drive vehicles our rental company saw fit to give us perhaps the world's MOST 2wd car: a brand new, baby blue Nissan Almera, complete with scoop front grill, lo-profile tires, and the ground clearance of a basset hound. 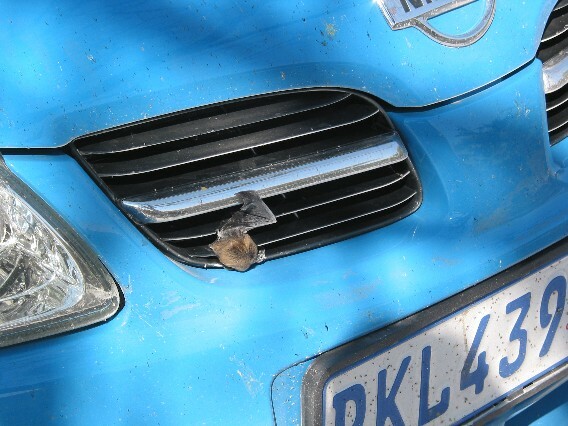 After a despondent bat committed suicide on the car's grill, the "Batmobile" got its name. We felt fortunate that during the thousands of miles on the road, we only managed to get stuck in soft sand twice. There were, however, other problems. We blew a tire on one of Namibia's infamous gravel roads one day and had to detour some 100 miles in order to get the tire replaced. 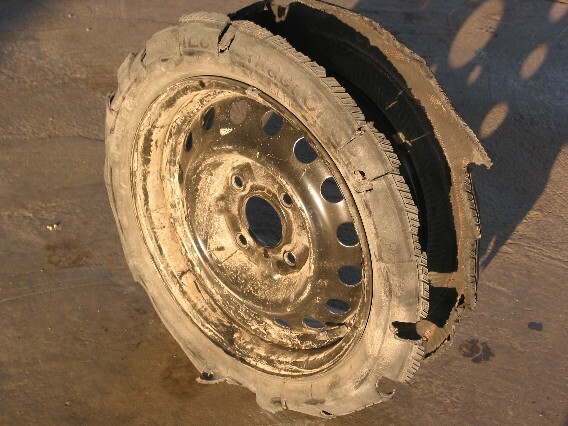 Then, after suffering that blow to our budget, we were stopped leaving town by a police officer and hit with a ticket costing as much as the tire. That will not go down as one of our favorite days on The Enchilada. On the good side, having the car enabled us to find some great places to camp. 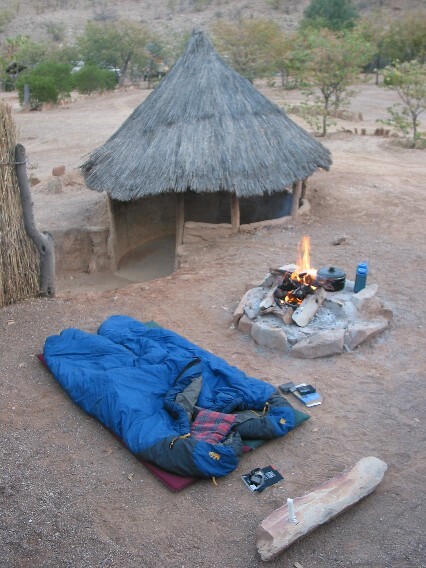 We took advantage of many of Namibia's amazing campgrounds, often set in the middle of beautiful scenery. When the weather was right, we even slept out under the stars. 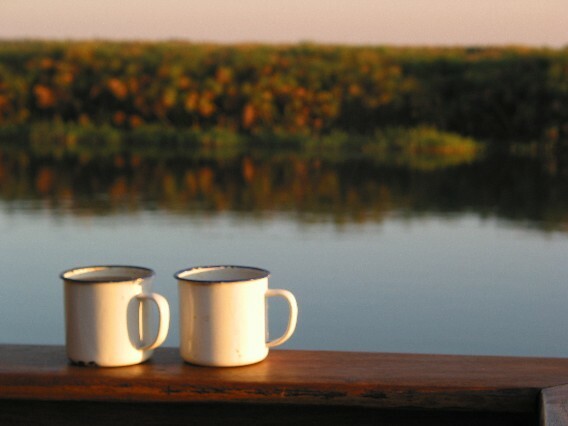 One of our favorite spots was in a campground located within a rhinocerous sanctuary. Our fenced in campsite was called "Elephants' Favorite." During our stay, alas, none stopped by (to Karen's relief). 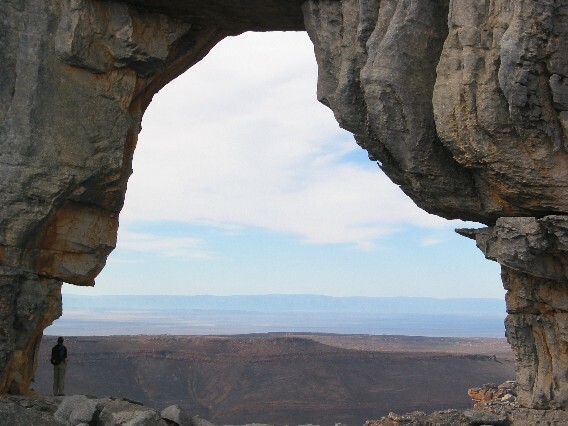 We continued south through Namibia, hitting just a few of the country's many natural wonders. 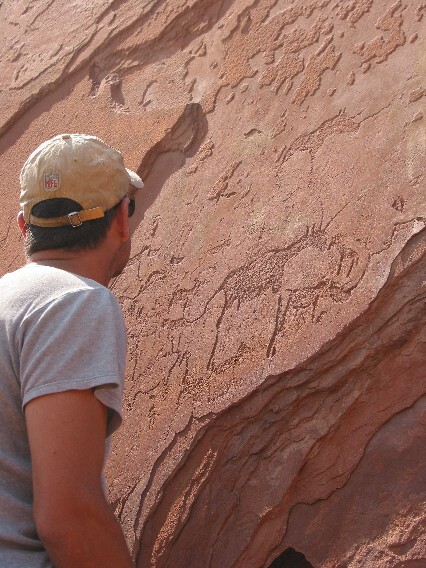 We saw centuries old rock art, carved by San hunters, that depicted the wild animals they encountered as they roamed the countryside. 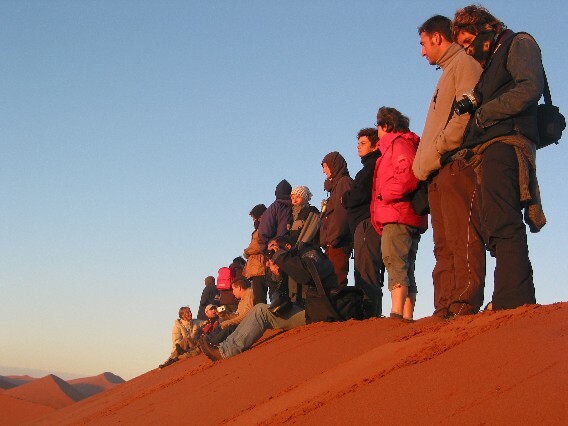 We also climbed up one of the tallest sand dunes in the world located in the Namib desert. We joined roughly one hundred others early one morning on the 20 minute walk to the top. 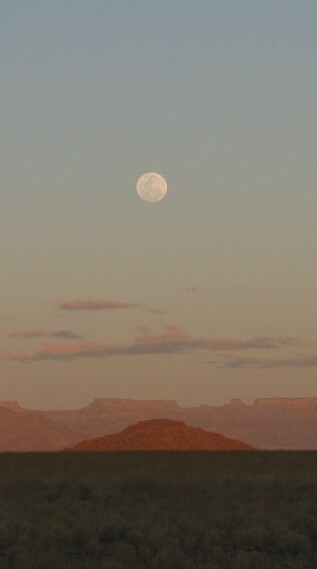 There we watched as the sun rose before us, and the full moon set behind us. 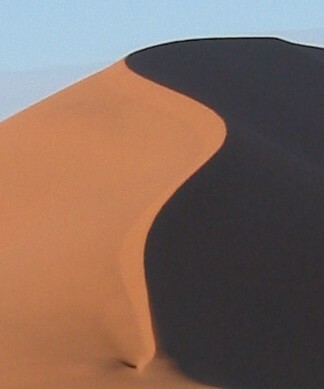 The dunes naturally have a reddish color to them, a quality exaggerated by the early morning light. From there we drove and hiked to a place called Deadvlei, one of the driest spots on earth. The combination of white, cracked earth, dead trees, blue sky and red dunes makes you feel like you walked into a corner of Salvador Dali's imagination rather than a spot in the African desert. Many times during The Enchilada we have been surprised by how lucky our timing has been while visiting different parts of the world (Lao New Year in Luang Prabang or the Lotus Lantern Festival in Seoul, for example) but this time, for once, our timing was off. People told us all along that mid-August would be great for seeing wildflowers in the northwest corner of South Africa. Well, we were there, but because of a very dry winter the flowers were not. Instead, we went into the spectacular Cederburg Wilderness and spent a day attempting one of the more challenging hikes either of us has ever encountered. As we squeezed through crevices and helped each other over boulders we laughed at the fact the women who sold us our permit called this route "fun". Once through to the top, of course, we decided it was "fun" ... and the natural arch and view at the end of the trail was certainly worth the effort. We took advantage of our last few days with the rental car to see some sights around Cape Town before heading into the city. 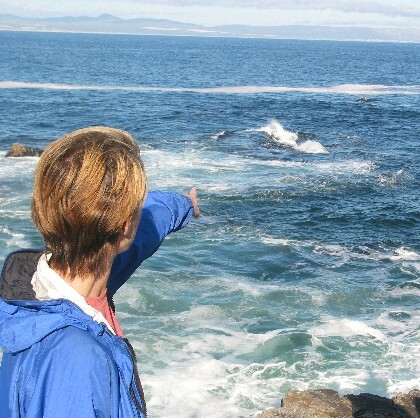 We went to the seaside town of Hermanus, which bills itself as having the best shore-based whale watching in the world. Having been there, we can't argue with that statement. In the bay right by the center of town Southern Right Whales congregate every July-October. Some of them (we are not kidding) come to within 100 yards to shore. (Karen is helping to point one out now). 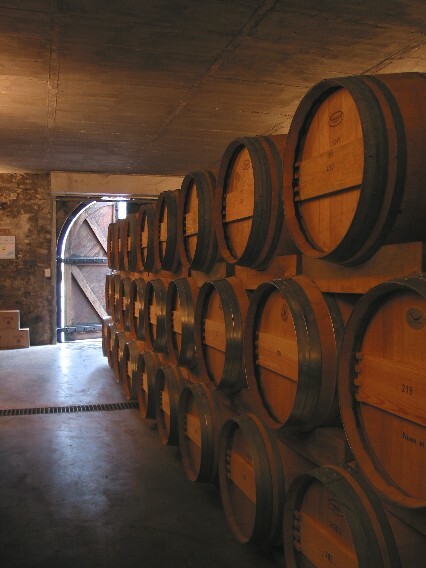 Then it was on to Stellenbosch, the center of South Africa's wine industry. In the middle of a driving rain storm (our first truly rainy day since Sydney, Australia) we managed to visit four wineries before returning to our backpacker hostel and planting ourselves in front of the fire for the rest of the night. The following day we toured the Cape Peninsula, ending up at Africa's southwestern most point, the Cape of Good Hope. We had been told over and over again by South Africans that because of Cape Town's unpredictable weather, if we could see the top of Table Mountain we should climb it. Table Mountain is the huge, flat-topped mountain which looms over downtown Cape Town in every photograph. Again, it was recommended we take the "fun" route. After three hours of scrambling, we joined 500 or so other tourists at the top who simply took the cable car up. Once in the city, we were fortunate to be able to stay with a couple of Cape Town families through our membership with Servas. The Kays and the Loubsers, in addition to providing us with wonderful hospitality, our frank and honest conversations helped us to better understand life in South Africa today. 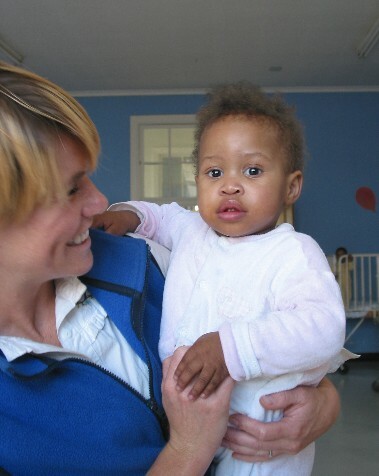 Through their connections, we also spent one touching afternoon at a hospital visiting children who suffer from tuburculosis. Our South African education continued with a visit to Robben Island, where Nelson Mandela was imprisoned for many of the 27 years he spent as a political prisoner. 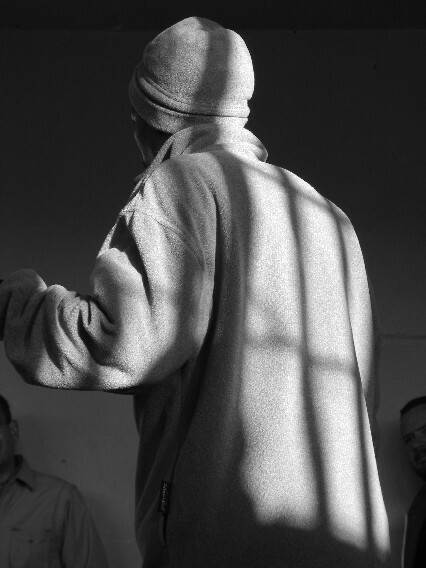 Our guide for part of the tour was a former political prisoner himself, held at Robben Island for five years in the 1980's. 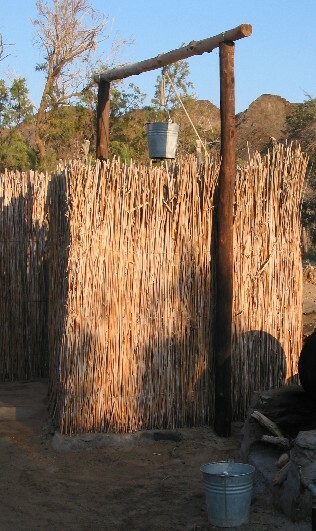 It was an experience very typical of our time in southern Africa. From watching wild animals in their native habitat, to seeing cultures still living in traditional ways, to witnessing history in the making, we were given the great opportunity to see things we could not have seen anywhere else in the world.